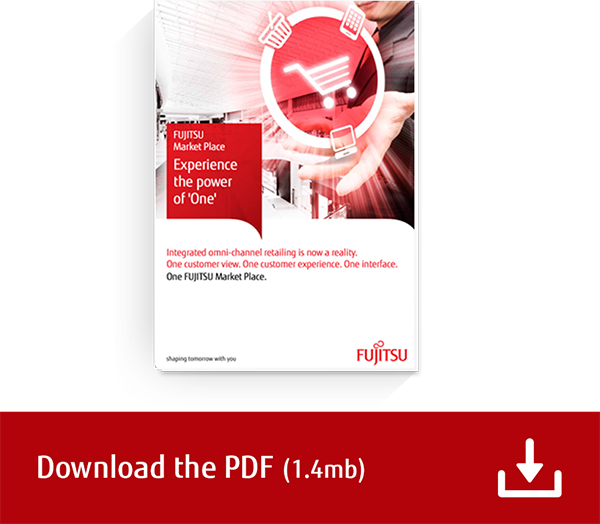 Fujitsu Market Place is a new omni-channel retailing point of service (POS) application, developed to support enterprise-wide order and transaction fulfilment. It combines orders and in-store shopping into a single transaction to deliver a seamless and consistent customer buying experience across online, mobile channels and traditional PoS. We designed Market Place to simplify and improve the customer retail experience. Whether your customers are browsing online, confirming choices by smartphone, ordering in-store on a tablet PC, or asking questions of a call centre, our platform ensures continuity and consistency regardless of the channel. By delivering the digital retail experience that customers have come to expect, you are enabled to build long-term relationships that can increase customer loyalty and retention. Why choose Fujitsu retail solutions? With over 30 years of experience delivering retail technology and solutions to UK high street stores, we have the expertise you need to overcome your efficiency issues. With our help, you can improve your customer experience, reduce your costs and improve your profitability.